The Laurel sub may be a mainline but it is not the transcon when it comes to the track structure. Right now it takes most trains nearly the full 12 hours to go the 225 miles between Laurel and Great Falls thanks to various permanent and temporary slow orders. No big deal though since this railroad isn’t used to speed trains from one point to another. Yesterday I chased a train north from Moccasin to Stanford. I passed the train at Windham and expected it would arrive in Stanford within 10 minutes. What I forgot about was the 10 mph slow order in the tunnel south of town. I headed to Geyser for my next photo and had made the 15 minute drive (at 70 mph) before I heard the detector just south of Stanford go off. I waited around Geyser for more than 45 minutes before I heard the train say they were approaching Geyser….at 10 mph. Yep, more 10 mph slow orders. The good news is the section crew spent most of the day between Stanford and Geyser with a tamper and regulator so hopefully some of the 10 mph slow order were lifted. M-SHMLAU passes through Stanford at dinner time. 5pm Update: All the tamping and regulating has paid off. The section crew lifted .4 of a mile 10 mph order this afternoon. 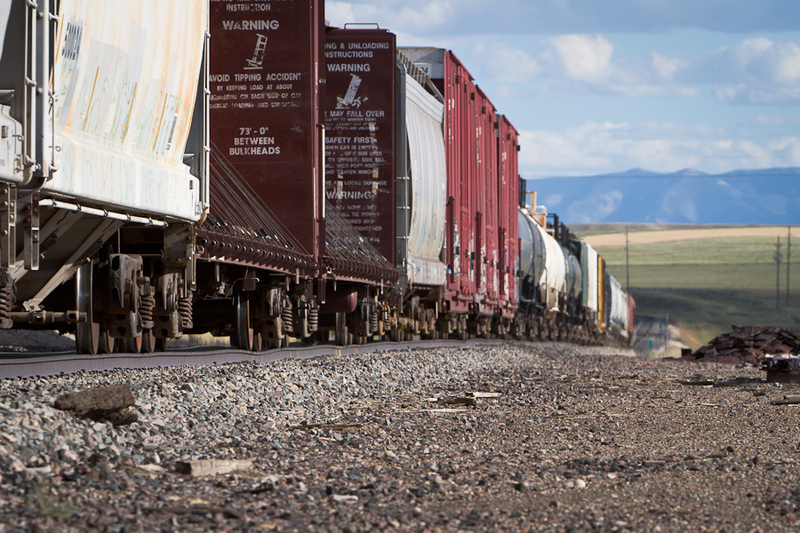 Commerce will be back at high speed in Central Montana! Ahhh, it’s good to be back in Montana where there are plenty of wide open spaces. I’m currently in Stanford, MT which is located near the center of Montana and in the transition between the great plains and the Rocky mountains. This location provides plenty of photographic variety. One minute you can be out snapping photos in the grasslands the next you can get a photograph with towering mountains in the background. Perfect! The first northbound of the day is the M-LAUSHM (Laurel – Shelby). Near the Grove elevator (Moccasin, MT) it’s pretty much wide open space. Mountains. Near Geyser the Laurel Sub passes just south of the Highwood mountains and a couple of buttes including Square Butte shown here. It is mud season in central Montana now. With snow down to the valley floor in early May followed by warm temperatures streams are running high and low spots are collecting water and turning to mud. 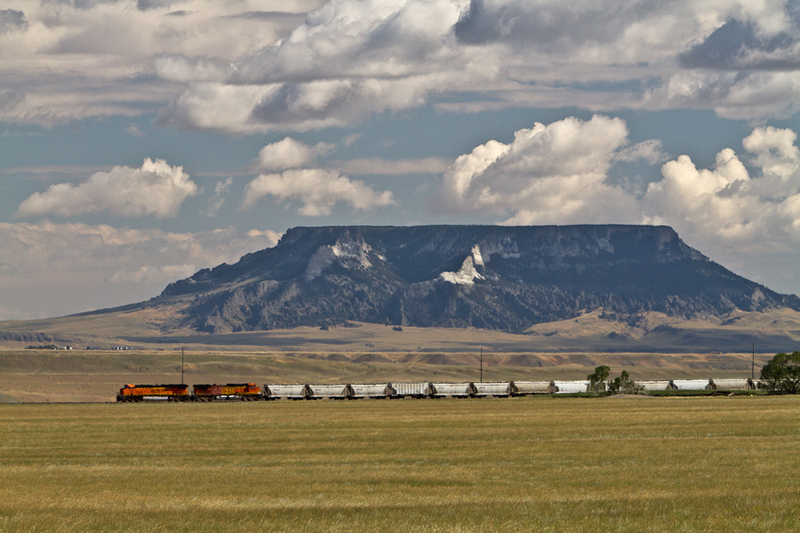 It’s a good thing there’s lots of mud to go around because Central Montana Rail and BNSF seem to enjoy rolling in it. Read this article by James Woodburn, a Geraldine-area producer who serves on the Central Montana Rail board of directors, and see what I mean. Let’s hope mud season is short and everyone can get back to business soon. So maybe this post’s title is a bit presumptuous but in Central Montana having a multi use track in 2010 is pretty big news. In a January 11 article, the Lewistown News-Argus (covering Central Montana like the stars!) 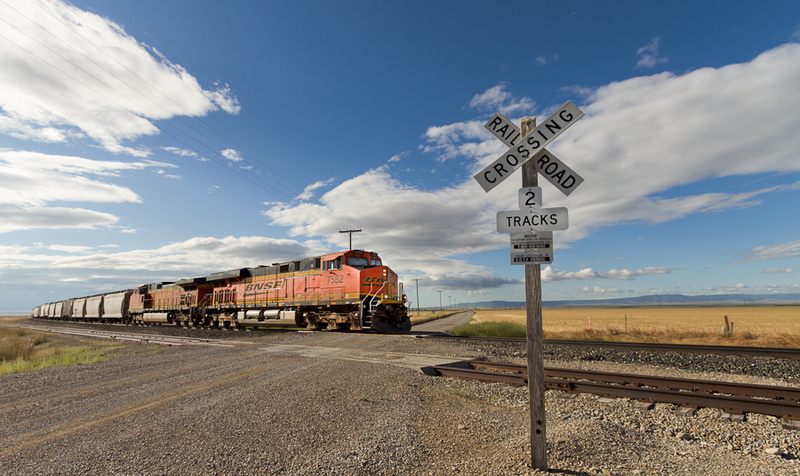 reports that Central Montana Cooperatives is planning to build a fertilizer hub on the loop track at Moccasin (known as Grove, symbol GVE to BNSF). The loop track is currently home to United Harvest’s elevator which loads unit grain trains throughout the year. The two facilities will certainly make Moccasin a much busier stop on BNSF’s Laurel Sub and will increase its importance to agriculture in the area. This new facility will likely improve Central Montana Cooperatives’ delivery efficiency thanks to reduced costs to ship bulk product. Obviously lower or steady production costs will make farmers in the area quite happy. With all this good news I want to stop for a minute and consider the other player in the railroad game at Moccasin, the Central Montana Railroad. They make their living on the carload business distributed to smaller communities along their line. With the addition of the fertilizer hub what’s going to happen to them when a co-op in Geraldine decides to truck fertilizer from Moccasin because its cheaper? 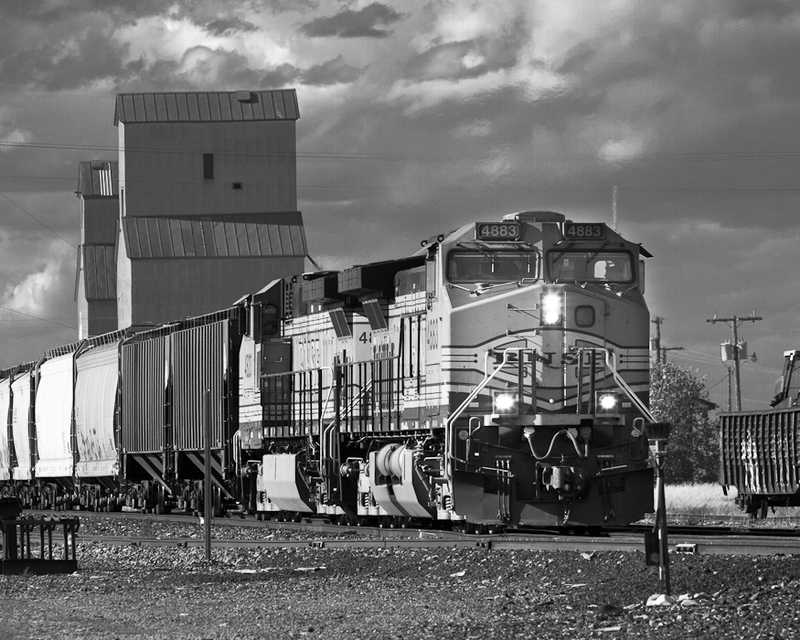 CMR and the State of Montana are already in a tussle with BNSF over subsidy payments so I’m afraid that the grain shipping business already lost, the subsidy payments lost, and now the potential for the fertilizer business to be lost may not be good for the future of the CMR freight business. As a railfan I certainly don’t want to see the CMR lose more business and disappear. Their line is one of the few operating pieces of the famed Milwaukee Road that still operates 30 years gone and has many scenic highlights that are hard to find anywhere else. On top of that they host the Charlie Russell Chew Choo that is not to be missed on a visit to the region. The CMR aside the fertilizer hub is still good for business in Central Montana and should be looked at positively for Central Montana and Moccasin. It may however be one straw too many for some in the region.